Defending IMSA WeatherTech SportsCar Champions Eric Curran and Dane Cameron scored their first win in 2017 on Sundays at Canadian Tire Motorsport Park. 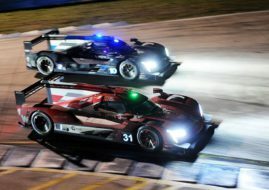 A duo in the #31 Whelen Engineering Racing Cadillac DPi survived all the challenges and troubles of the wild race which was marked by changing weather. At the end, the #31 crossed the finish line behind a Safety Car, beating the #85 Oreca of JDC-Miller Motorsports, driven by Stephen Simpson and Mikhail Goikhberg. Ryan Dalziel and Scott Sharp‘s #2 Tequila Patron ESM Nissan DPi finished in the third place. It was Cadillac’s seventh win of the season, with each of three teams now having won a race. The decisive moment of the race happened 21 minutes before the end of the race, when this season’s five-time winner Jordan Taylor in the #10 Cadillac crashed out of the lead in a heavy accident with #4 Chevrolet Corvette C7.R of Tommy Milner. The Chevrolet was badly damaged while Taylor remained on the track for ten minutes under the Safety Car period but he was forced to pit because of damage repairs. One more Safety Car period followed in the closing minutes after David Ostella flipped in the #52 Ligier of PR1/Mathiasen Motorsports. In the GTLM class, the #25 BMW M6 GTLM of Bill Auberlen and Alexander Sims was a victorious car for the second race in a row. They won ahead of #24 BMW of John Edwards and Martin Tomczyk, who reached P2 after the second-placed #911 Porsche had to retire due to mechanical problems with just 10 minutes to go. The #67 Ford Chip Ganassi Racing Ford GT of Ryan Briscoe and Richard Westbrook rounded out the podium. It was Auberlen’s 57th career victory in major North American sports car competition, moving him to within three of leader Scott Pruett on the all-time list. Performance Tech Motorsports’ James French and Pato O’Ward scored the sixth consecutive win for the #38 Oreca FLM09 in the Prototype Challenge class. They weren’t without problems. After leading for much of the early part of the event, O’Ward hit a piece of debris with 54 minutes remaining and had to pit to replace the nose of the car. The team lost a lap in the process, but raced back to the lead lap and took the lead. In the GTD class, Stevenson Motorsports won the race with the #57 Audi R8 LMS, driven by Andrew Davis and Lawson Aschenbach. They inherited a lead when the leaders in the #14 3GT Racing Lexus Sage Karam and Scott Pruett were penalized for pitstop infringements. Andy Lally and Katherine Legge in the #93 Michael Shank Racing with Curb-Agajanian Acura NSX GT3 finished second to continue their streak of good results after two class wins in previous races. GTD points co-leaders and defending class champions Christina Nielsen and Alessandro Balzan finished third in the #63 Scuderia Corsa Ferrari 488 GT3. The next IMSA WeatherTech SportsCar Championship round is a two-hour and 40-minute race for GTLM and GTD cars at Lime Rock Park on Saturday, July 22. The Prototype and PC classes will be back to the track at the Continental Tire Road Race Showcase at Road America on Sunday, August 6.